How ya all doing with this wild ride of a Mercury retrograde? I was rather fascinated with what was going to happen during this one due to this retrograde taking place entirely in the sweet sign of Pisces, conjoining Neptune. Mercury is a fast moving planet that orbits the Sun in 88 days and represents how we think, communicate and move around on earth. Neptune is a slow moving planet that takes 164 years to orbit the Sun and represents spirituality, intuitiveness, and ideals. Neptune rules Pisces and loves to be in this sign, which it has been in since 2011 for 12 years. Mercury whips through the zodiac spending only 15-60 days (60 days is a retrograde period) in a sign and rules the sign of Gemini. (Now you know where they got the term “mercurial”.) So we have the turtle (Neptune) and the hare (Mercury) here, and because of the Mercury retrograde happening, they meet up and hang out for a while. This is very unusual. You could say that the hare, Mercury, is taking a LONG nap in a dreamy fog with Neptune and has forgotten his duties as a messenger around the Earth! But has he? Perhaps he went off on a Spiritual retreat with Neptune and is learning higher aesthetics? This was particularly felt on March 14th when Mercury conjoined the Sun at 24 degrees Pisces and then today, March 25th when Mercury conjoins Neptune at 16 degrees Pisces. He then stations on Neptune at 16 degrees for a few days then will go direct in on the 28th. 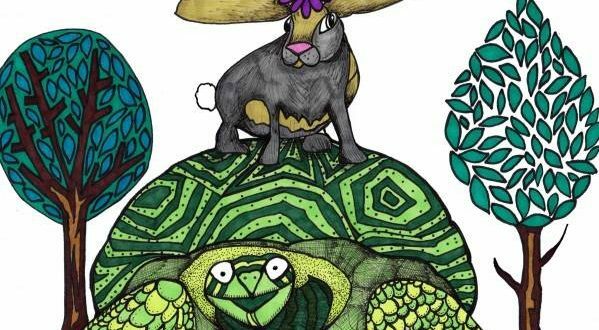 These two Planets, the turtle and the hare stay conjoined till well into April since Mercury has to pick up speed after his spiritual retreat in retrograde. The Internet has been wonky almost the entire stretch of this Mercury retrograde even the mighty Facebook was shaken by this one. My brain overloaded easily with all the information and it all seemed confusing and unsettling. If I pushed against the tides of the retrograde I found myself frustrated and falling down a lot, quite literally. The tidal influence of this alignment in Pisces was not to be taken lightly! I found that I needed to spend more time offline and re-devote myself to nature and creativity. Pisces can always center themselves through the call of the creative muse. Meditation has been incredible too and I have enjoyed setting in nature, being filled with such joy! Going with the flow, connecting to creativity and taking walks in nature, I found more than my balance, I found peace. Even though the Mercury retrograde will be over soon, the affects will continue with this conjunction. Slow down and smell the spring flowers. Perhaps start a meditation practice or take the weekend off of all media and spend it in nature. How can you re-frame, re-imagine and re-connect during this opportunity?